Ahead of the Reagan Institute’s Summit on Education commemorating the 35th anniversary of the release of “A Nation at Risk,” The 74 is publishing a special series of articles, essays, and retrospectives about the release and the aftermath of the famous education report. See our full series here. This month marks the 35th anniversary of “A Nation at Risk,” the seminal report that changed the face of American education. Released in 1983 by the Reagan administration, the report took a critical look at the state of American public education. It was, to put it mildly, not a pretty picture. The report found that SAT scores had fallen from 20 years prior, only a third of public school students could complete multi-step math problems, and just 20 percent could compose a persuasive essay. It’s a call that bears repeating. Three and a half decades later, the world is still changing — and changing far more rapidly than the authors of the report could ever have foreseen. The complexities and challenges facing American society have shifted dramatically since 1983. We need an education system that can prepare students to meet these challenges. And to realize that, we need another national conversation on education that addresses those very students as well. Take advancements in classroom technology as an example. The devices that are now available to enhance student learning would have been unthinkable even 10 years ago, let alone at the time of the release of “A Nation at Risk.” On the one hand, such innovations allow unprecedented levels of connectivity and access to information. And, rightly used, they can help prepare students for the job market. The report’s observation that “the demand for highly skilled workers in new fields is accelerating rapidly” continues to hold true: There are half a million computer science jobs in the country, waiting for qualified applicants to fill them, according to Code.org. On the other hand, many studies show that technology in the classroom can be a distraction, and the pace of technological development makes it difficult for schools to keep up. How can we prepare students to have the nimbleness and flexibility they’ll need to succeed as technological changes become more and more rapid? And what possibilities are there for those who have already spent decades in the workforce? Automation has put thousands of workers all across the country out of a job but created new, previously unimagined jobs for many. We must consider the possibilities of adult education, equipping older workers to adapt alongside technology. If we don’t start investing more wisely in our children’s future now and preparing them to thrive amid these challenges, we won’t just negatively impact the job market or the economy. We’ll seriously compromise the future of our democracy. Our track record since he spoke these words in 1983 hasn’t been especially strong. A 2017 Brookings Institution study showed alarming misunderstandings about the nature of the First Amendment among university students. And we’re not just failing to prepare our students to become full-fledged participants in our democracy; in many respects, we’re also failing to prepare them to become active contributors to our economy. Thanks to the gargantuan size of student loan debt, more and more millennials are living at home, and fewer and fewer are investing in real estate or the stock market. Federal Reserve Chair Jerome Powell recently admitted that student loan debt — now at a whopping $1.38 trillion nationwide — could stymie our nation’s economic growth in the long run. No matter what you think of the proposal, the fact that it’s even up for consideration is indicative of the major shifts currently shaping our education landscape. Ignoring these forces is no longer an option. If we want our students to thrive in the decades to come, we need to take a serious look at all aspects of education — from civics to careers and from elementary school to college. Failing to do so is, ultimately, failing our students — and, in the long run, our nation. A call for a substantive, honest bipartisan conversation on education in this hyperpartisan age might sound naive — but it is, at the end of the day, a necessity. That’s why we’re hosting the Reagan Institute Summit on Education this week. Leaders from across the aisle and across various industries will come together to have this conversation, each offering insights and raising concerns specific to their sectors. In the meantime, the conversation starts here, in the pages of The 74. I invite you to follow along in the following days as we examine several of the topics and themes that RISE will address. It’s a great opportunity to gain perspective on the most pressing issues in our education system and develop your own thoughts on them as well. Only by carefully considering and openly addressing these issues can we realize the full measure not only of the potential of our students, but of the promise of our great nation. John Heubusch is the executive director of the Ronald Reagan Presidential Foundation and Institute, which is presenting the Reagan Institute Summit on Education in April 2018. He is also the author of the best-selling novel The Shroud Conspiracy. 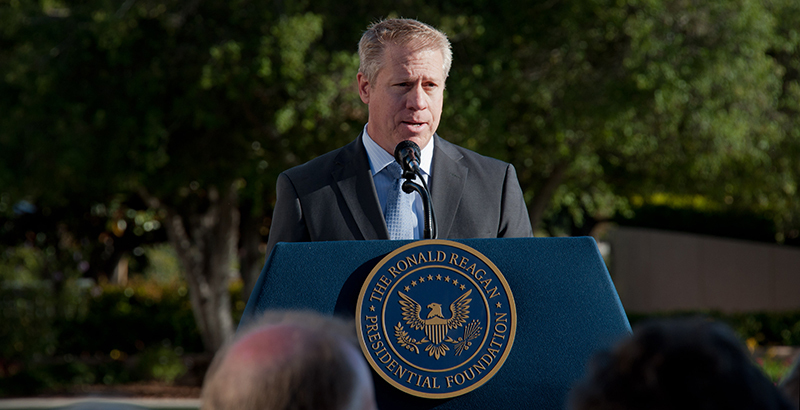 John Heubusch is the executive director of the Ronald Reagan Presidential Foundation and Institute. He is also the author of the best-selling novel, The Shroud Conspiracy.